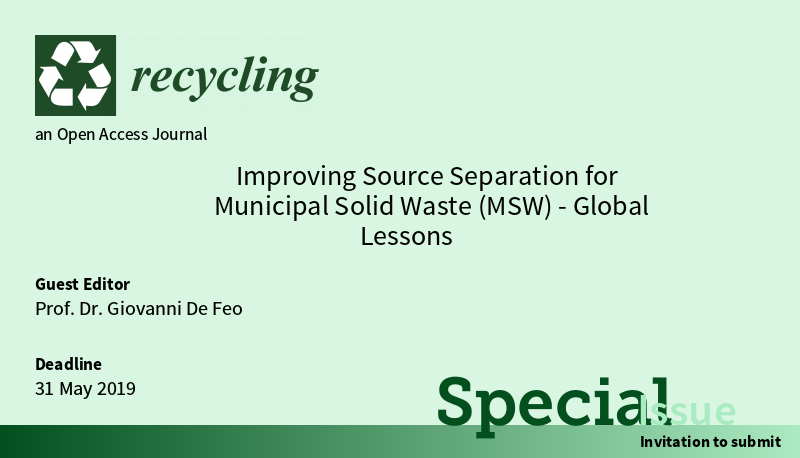 I recently accepted to serve as the Guest Editor for the Special Issue “Improving Source Separation for Municipal Solid Waste (MSW)-Global Lessons” of the journal Recycling (https://www.mdpi.com/journal/recycling). In this regard, I would be very pleased if you would agree to contribute a short communication, research paper, or a focus review on this theme. Given below is some information that you may find useful in your consideration of this invitation. /Recycling/ is an international, peer-reviewed open access journal of scientific studies related to waste reutilization and resource recycling. It is published by MDPI, Basel, Switzerland. You can access more information about the journal from http://www.mdpi.com/journal/recycling/about. The submission deadline is 31 May 2019. Your paper will be published in open access form and free of charge if accepted after peer review. You may send your manuscript now or up until the deadline. I hope this invitation will receive your favorable consideration.